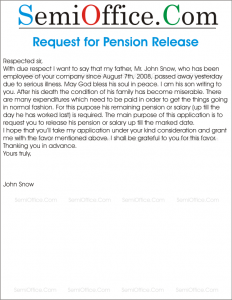 Sample request letter application for release of pension, gratuity fund and other allowances after the retirement or resignation from your job. With due respect I want to say that my father, Mr. John Snow, who has been employee of your company since August 7th, 2008, passed away yesterday due to serious illness. May God bless his soul in peace. I am his son writing to you. After his death the condition of his family has become miserable. There are many expenditures which need to be paid in order to get the things going in normal fashion. For this purpose his remaining pension or salary (up till the day he has worked last) is required. 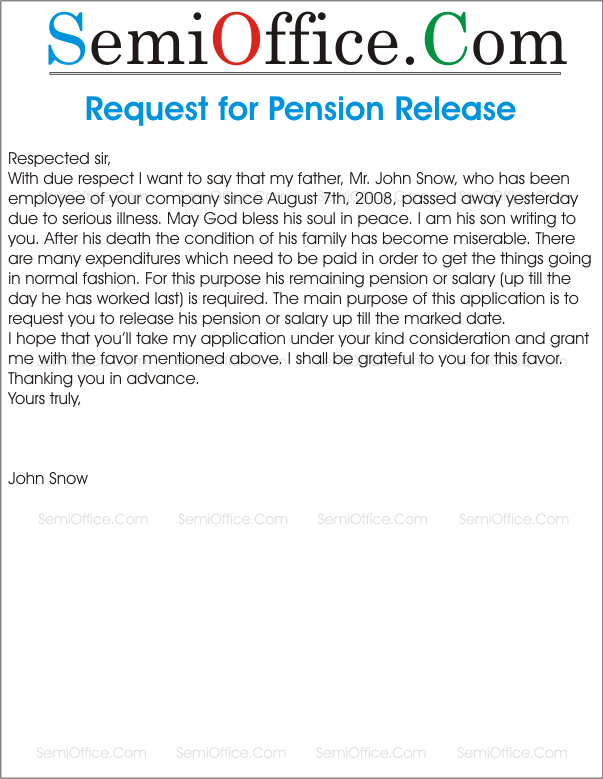 The main purpose of this application is to request you to release his pension or salary up till the marked date. I hope that you’ll take my application under your kind consideration and grant me with the favor mentioned above. I shall be grateful to you for this favor. With due respect, it is to inform you that I have been working for USA Railways for 30 years as an engine driver. Now, I have retired upon reaching maximum age limit of 60 years. Throughout my service, I have proved to be a hardworking employee. My salary was my only source of income and now I am facing difficulties to bear my expenses. I therefore request you to release my pension from the USA railway’s pension fund as early as possible so that I can take care of my necessities. I am writing this letter to inform you that I have applied for my pension release as I am retired now and my living is depending upon this. I have completed all the official work and submitted a copy in your admin department. I request you to process my application as soon as possible as my family is depending on this. I have written this letter with all hopes to get a positive reply to my request. I shall be really thankful to you for this favor.